1. Minutes of last year’s AGM held on 19th December 2012. 7. Pooling our Ponds Project. Red Squirrel feeders and cameras have recently been installed within the forest, working both day and night! 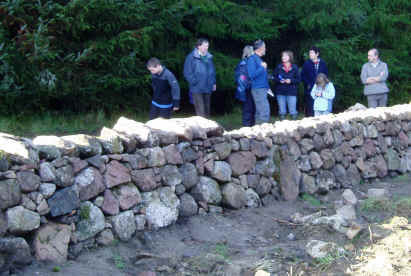 FDF hosted a celebration of Pitcowdens Heritage Site, Durris on Saturday 27th August 2011. 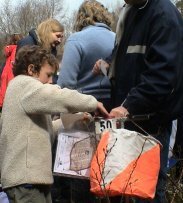 The event included – a local storyteller, quilter, dyker, wildlife ranger & bodger. Forestry Commission Scotland (FCS) has recently acquired grazing land at West Brachmont in Durris. See pdf MAP for more information. At Pitcowdens 17th July 2010. On Saturday 17th July FDF volunteers were out in force at Pitcowdens in support of the Scottish Natural Heritage (SNH) Action Earth project, organized in partnership with FDF, FCS and supported by Community Service Volunteers. More information on this day will be due in our next Newsletter, out in September. 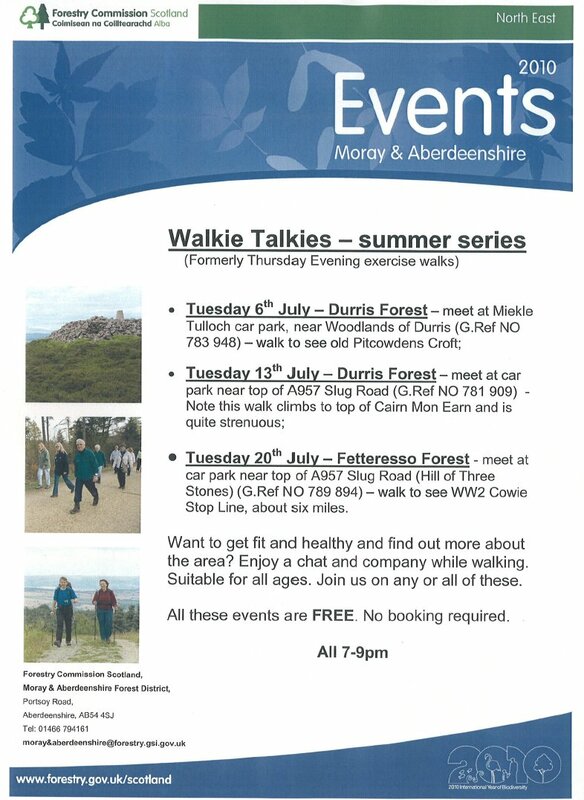 July 2010: 2 hour guided walks at Durris Forest starting at 7pm on 6th and 13th July. Progress at Pitcowdens. 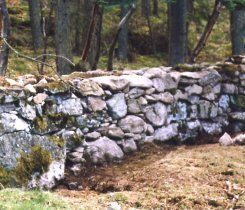 Rebuilding drystane dyke on Pitcowdens site is almost complete. Plans are underway to install a seat at the viewing point, along with further planting and site clearance. Forestry Commission Scotland now likely to move ahead with sale of a small part of Kirkton Office site during 2010. After inspecting the site the FDF board decided not to register an interest. 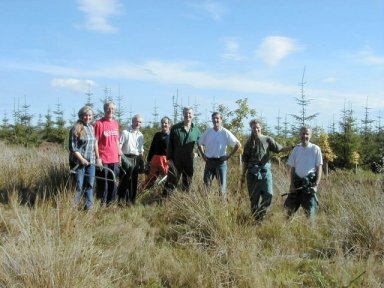 *In June 2008 FDF were successful in their application for a grant from the Big Lottery Fund to develop the Pitcowdens area within Durris Forest. This is part of the 'Breathing Spaces' project (also being supported by the BBC). Work is now well underway with path building, signage, planting and dry stone dyking within this old farming croft. The invited talk: "Durris - The Scottish National Arboretum That Could Have Been" by Callum Pirnie, Head Gardner, Crathes Castle was very well received, and opened up a fascinating world of the early Victorian plant collectors. 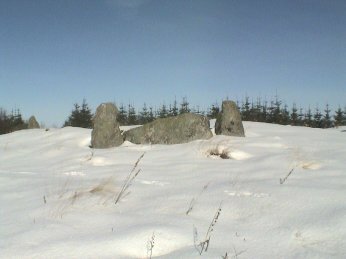 Their legacy at Durris remains partially intact, and includes many rare and now possibly unique tree specimens that likely no longer grow in their original habitat due to deforestation. 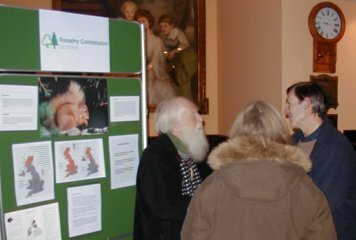 After this talk, a Special Public Meeting was held on the future of the Forestry Commission Scotland Site at Kirkton of Durris. December 2006 - Tree planting day a great success! 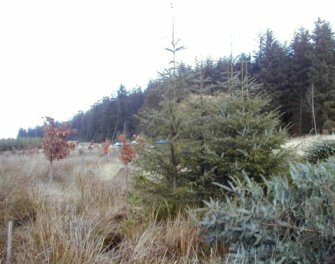 On Sunday 3rd December 2006 thirty adults and children gathered at Pitcowdens in Durris to plant 185 native broad leaved trees. 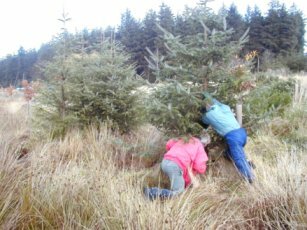 The project was organised in partnership with Friends of Durris Forest (FDF), Forestry Commission Scotland (FSC) and Durris Primary School. After the previous nights stormy weather they were lucky enough to have dry and even sunny spells during the planting time. The December newsletter gives more background to the longer term plans for this area. AGM held in November 2006 discussed some options for Kirkton site, including development as an environmental study centre. See December 2006 newsletter for more details. 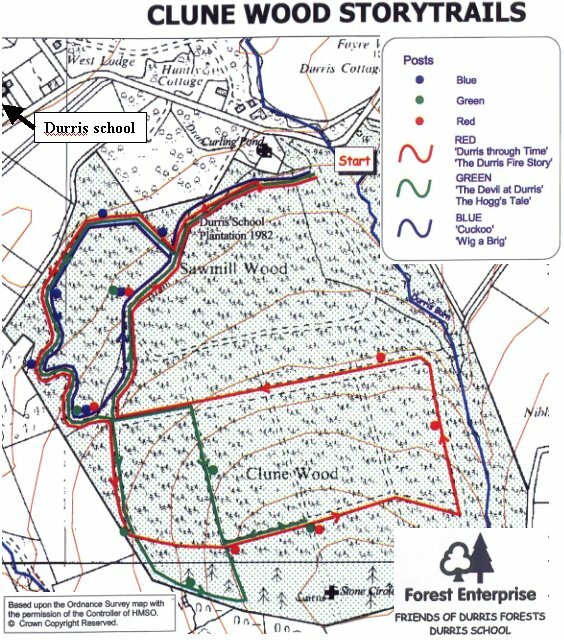 P & J article from late 2005 concerning the Durris FCS site. 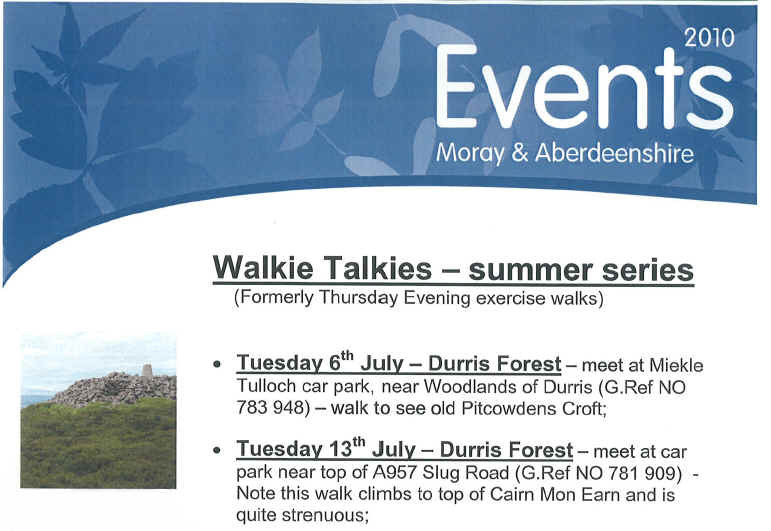 Sponsored walk on Elsick Mounth Sunday 26 June: 'Woodland Walk' and 'Dee to Sea'. A sponsored walk took place in fine weather on the Elsick Mounth in Durris on Sunday 26 June 2005 to raise funds for the British Heart Foundation. Two walks were available- Woodland Walk (5km) and Dee to Sea (20km). About 50 enthusiastic youngsters, mainly from local primary schools, took part in the two events. See the newsletter for more information. Pictures below! Durris Friends win Green Butterfly award. Autumn 2003: Two more sessions of Woodland Conservation. ... and the oak (ringed) is free to grow ahead! At first you don't see the oak.... then you do! 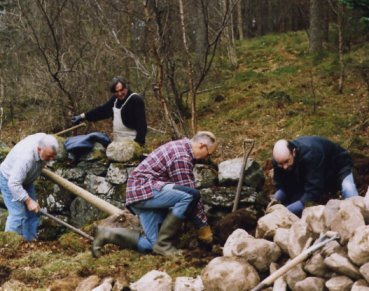 21 September 2003: Some of the regular brashers - apologies to those we missed.... take a short rest from the sawing and lopping self-seeded sitka spruce on the Elsick Mounth walk. The deciduous trees (here mostly oak) now have a realistic chance of survival..
Friends of Durris Forests founder member Jenny Watson formally opened the new Story Tail in Clune Wood, with the pipes and drums of the Craigmaroinn Pipe Band. 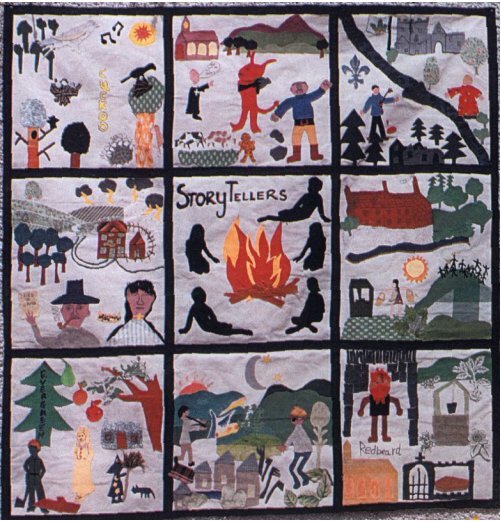 The six tales are based on local history and legend, and are illustrated with the children's pictures. 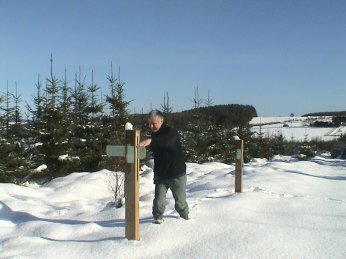 The stories are marked on finger posts on three trails through Clune Wood. The stories were created by the children of Durris School, with a little help from the story tellers Jackie Ross, Grace Banks and Stanley Robertson. 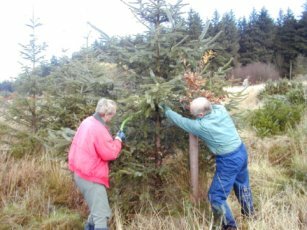 The project is a partnership between Friends of Durris Forests, Durris School, The Forestry Commission and Awards for All. On 1st March 2003 a Partnership Agreement came into effect between FDF and the Forestry Commission that requires and enables both parties to work together in the management of all the FC forests in Durris – both the main Durris Forest and 19 specified surrounding woods. The formal mechanisms for implementing co-management lie in a requirement to agree the five year plans for the woods, and the annual operating plan – with quarterly reviews of the latter. However the effectiveness of the agreement will rest on a willingness to interact and consult prior to these formal stages. 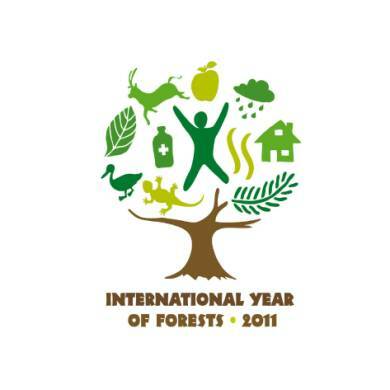 We look forward to an enhanced working relationship with Forestry Commission. 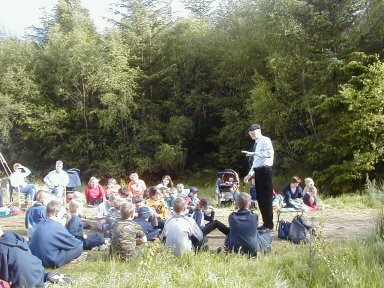 Renowned local story teller Stanley Robertson enthralled a group of Durris School children (and others) at the inaugural opening of the Story Trail at Clune Wood in 2002. 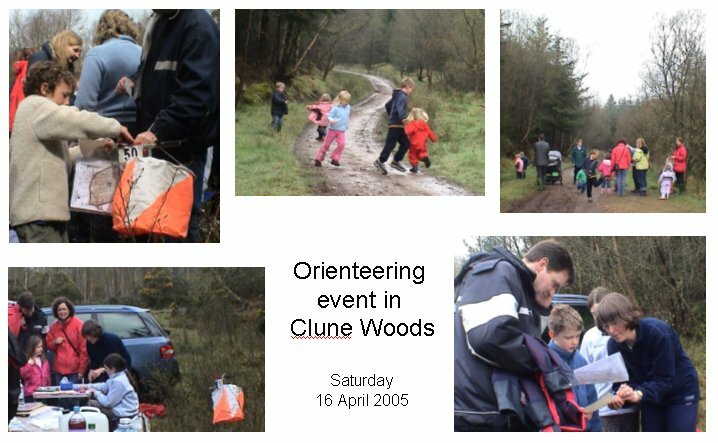 The signposts are now all complete, and their installation will be marked by a big event in Clune Wood 3.00pm Sunday May 11 2003. 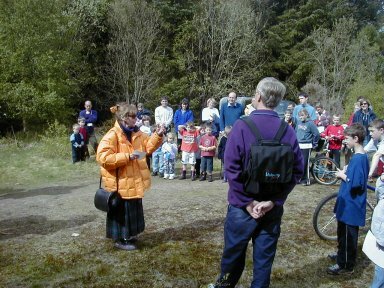 The children of Durris School and many others attended the opening of the Story Trail at Clune Wood in June 2002. Renowned local story teller Stanley Robertson enthralled them in the evening sunshine with one of his many his stories. 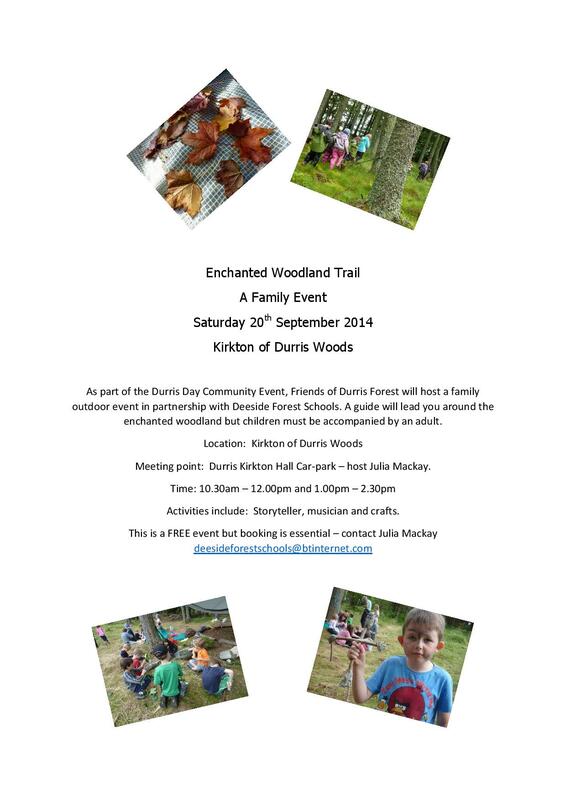 He then opened the new Story Trail in Clune Wood - the stories, drawing on the local history of Durris, included The Dowry, Red Beard and The Keiths and the Irvines. Everyone then walked the trail, which will eventually be signposted with permanent signs with additional help from Forest Enterprise. Thanks also to due to story tellers Grace Banks and Jackie Ross, and all the staff and helpers at Durris School. The project is aided by a grant from Awards for All, a lottery funded organisation. NOTE: Completed story trail officially open 11-May-2003. On the 14th April 2002, 14 intrepid horse riders set out from Bogenraith Farm on a 10 mile sponsored horse ride to raise funds for the British Horse Society Access Fund and the Equine Grass Sickness Fund. The weather was not in our favour, but this did not dampen the spirits and everyone had an enjoyable ride on the route through Durris Forest. On completion of the ride, riders were presented with a commemorative rosette. A total of £200 was raised, to be split between the two causes. Thanks to Noel Crozier for the use of the large field at Bogenraith Farm for parking. Also to Forest Enterprise and the band of helpers who put aside time to ensure the day ran smoothly and safely. 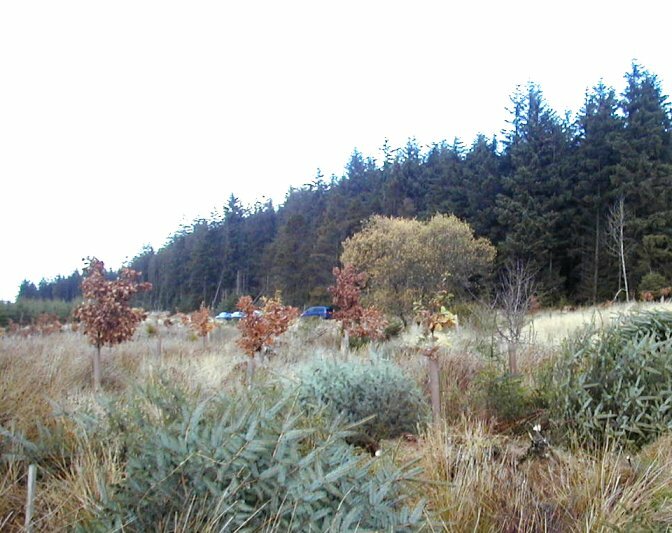 Tree clearing - 24 March: Activity day for clearing Sitka - another large area cleared of self-seeded sitka trees. Held at Kirkton Hall.....see minutes and photo for more information. Minutes of AGM + Photo of new committee. Tree clearing, 28 October 2001. 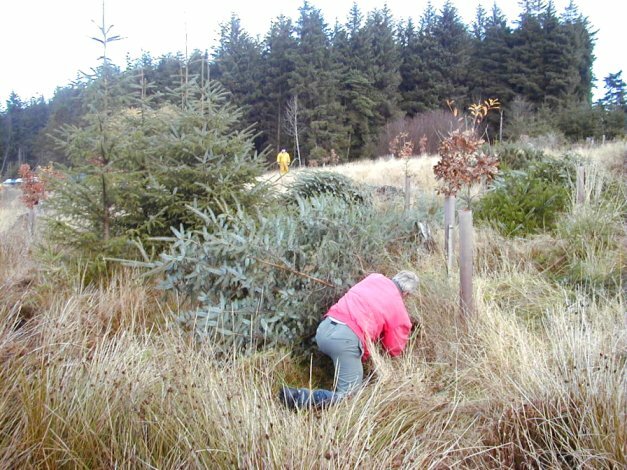 A dry, almost sunny day greeted about two dozen volunteers who removed many hundreds of self-seeded sitka trees in among the hardwood planted areas in Durris Forest. A vigorous, worthwhile effort by all involved! More days planned in the future (so please keep fit.....!). 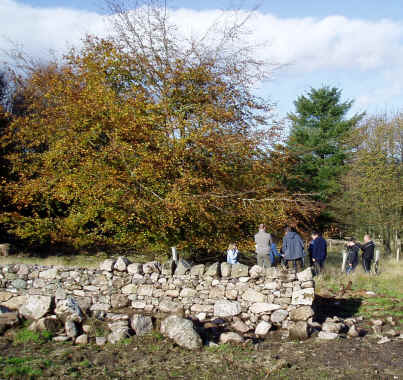 Louise Simpson, Forest Enterprise Ranger, led a fascinating autumn walk at Kirkton. She showed a twenty strong group the role of fungi in the nutrient cycle of the forest, the fine specimen and native trees, and other fascinations of forest ecology. 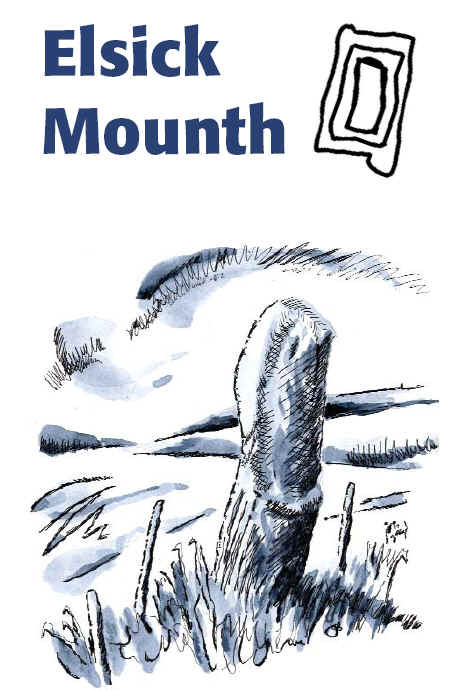 The walk was introduced by John Coyne, who told the story of Kirkton from the C13th, and showed the mortlock in Durris Kirkyard, the fine old C18th Bridge over the tumbling Sheeoch burn, and the Bronze Age Cairn in Kirkton Wood. A good turnout for the meeting at Kirkton Hall, combining discussion on 4 wheel drive activity in the Forest with our annual general meeting. Committee members were re-elected for a second term. 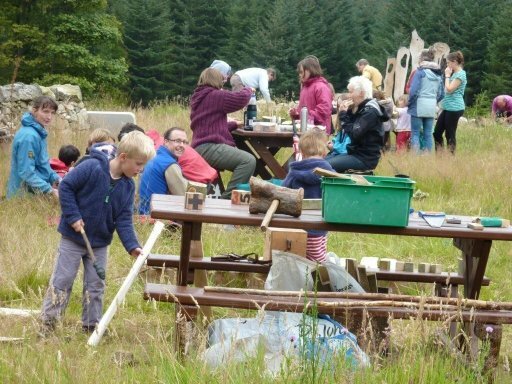 There was a steady trickle of people, young and old, who came along to try a variety of fun events in the forest, at the first Bike Fun Day run by Friends of Durris Forests. It was an unseasonably cold and wet day on 24 June. About 50 of all ages joined in the fun, riding mini time trials round the forest roads, hunting for cycle treasure, and various other activities. 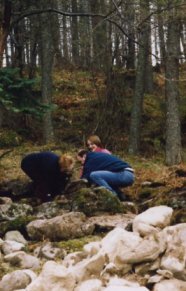 The event concluded with some traditional stories, linked to the forest location, by Kath and Jackie who had the participants enchanted. Many thanks to all those who helped to organise the activities. 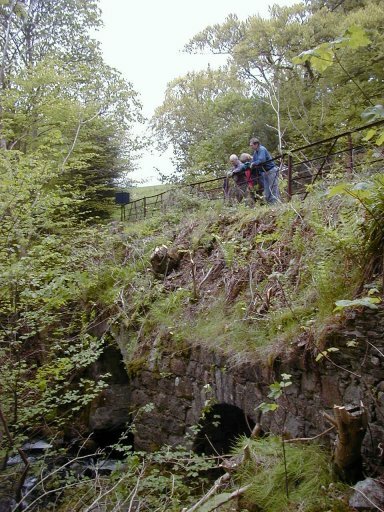 62 walkers set off from Park Bridge on this newly opened historic 12 mile walk linking Deeside with Stonehaven. Local MP Sir Robert Smith cut the inaugural tape, and joined in the first few hours of the walk, which runs right through Durris Forest. 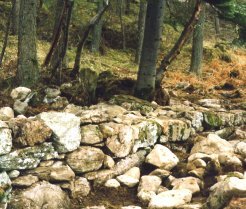 Bronze Age Farm and Cairn, 19 February 2000. 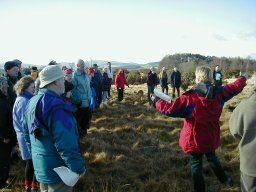 Ann Miles of Historic Scotland took a group of some 50 people to look at the remains of a 5000 year old Bronze Age settlement on the edge of the Forest area. Tree planting by Durris School, 31 January,2000. On a dry Monday morning pupils, teachers and mums/dads armed themselves with spades and went with Louse Simpson the forest ranger to plant a variety of trees in Durris Forest. 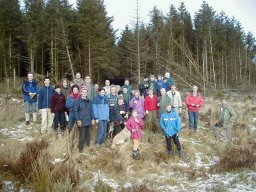 On a fine Saturday morning some 70 volunteers (including our local MP Robert Smith) turned out to clear brashing already cut down by the Forestry Commission.